Gutterglove Pro, Ultra and Leafblaster gutter guards are the once-and-for-all solution to gutter cleaning. 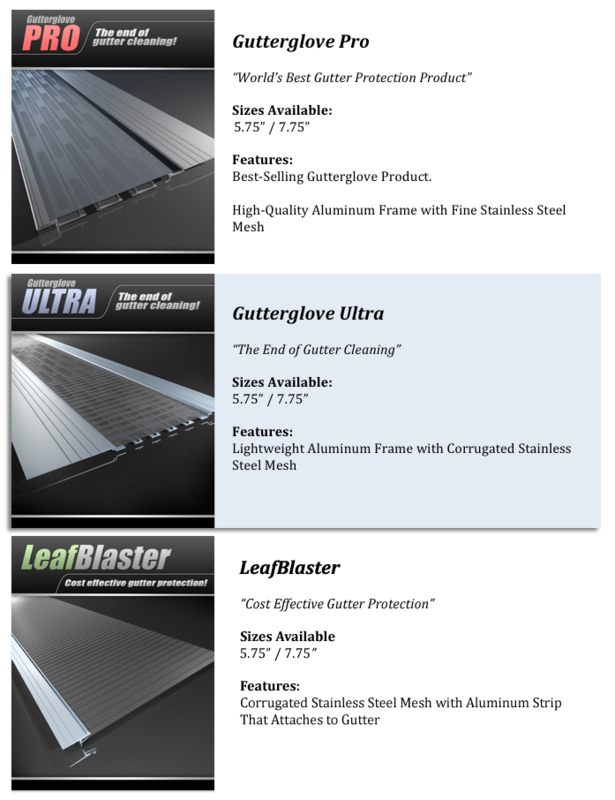 Gutterglove Pro, Ultra and Leafblaster gutter guards are made from high quality aluminum and stainless steel materials and backed by a 25-year warranty. Simply put, there is no better gutter protection product on the market. To protect your home from water damage, foundation erosion and endless maintenance, cover your gutters with Gutterglove Pro, Ultra or Leafblaster gutter guards today. If you are harvesting rainwater from your gutters, there is no better first-stage filter than Gutterglove Pro. In fact, using Gutterglove Pro alone on all of your gutters will filter rainwater to a suitable quality necessary for long-term storage. Gutterglove also prevents mosquitoes from breeding in your gutters, which prevents mosquito eggs from making themselves at home in your water tank. • Eliminates gutter cleaning forever. • Filters out all debris before entering your gutter. • Best first-stage filter for rainwater harvesting systems. • Barely visible from the ground. • Fits almost any type of gutter. • Fits almost any type of roof. • Filters over 150 inches of hourly rainfall. Please include: 1) Gutter width 2) # of linear feet needed 3) Type of Gutterglove (Pro - Fine Mesh is the most popular) 4) City and zip code (for freight estimate). You will receive a reply within 24 hrs. Call us now for a quote at 877-331-7008. * Gutterglove is not available for purchase online in all areas. If you are in a restricted distribution territory, we will put you in contact with your local Gutterglove dealer.